beauty | Live a life worth writing about. Happy Sunday! So a while back, I found this image of someone’s desktop background on tumblr, and instantly thought I need one…typical me. I thought it was a great idea to have a collage of all your favourite images instead of just one. You can do this with just about as many pictures as you want, but I went with 16. So, I searched around, and I’ve made one of my own! 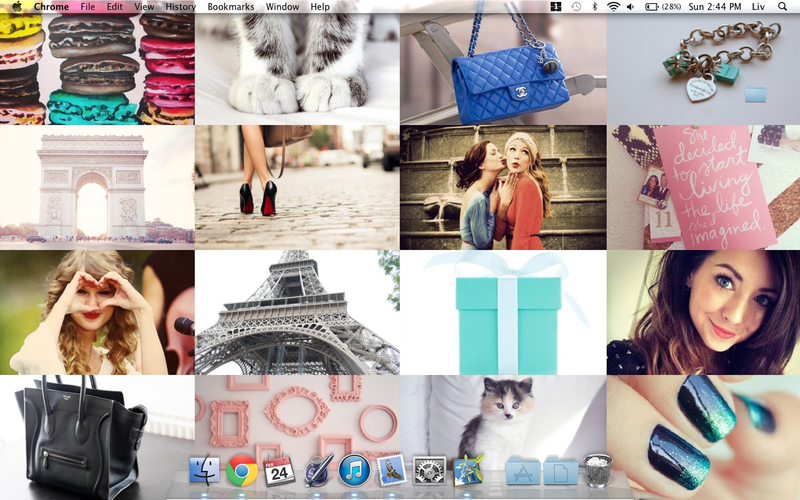 I just have some things that either inspire me, or my favourite things on there. It is always interesting to look at, and I can constantly make more and more, and change it up whenever I’d like. They are really easy to make and play with in PicMonkey. To start, go to www.picmonkey.com and click on “Create A Collage”. 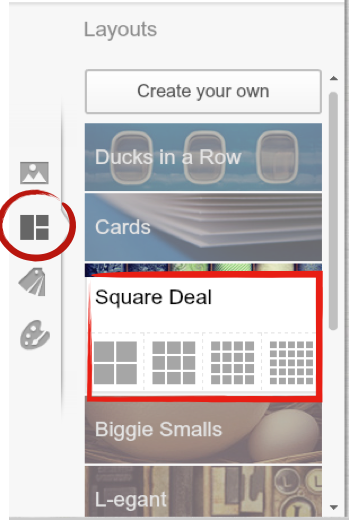 Click on “Layouts” on the left, and then click on “Square Deal”. For mine, I chose the third option, which gives you 16 pictures to work with. 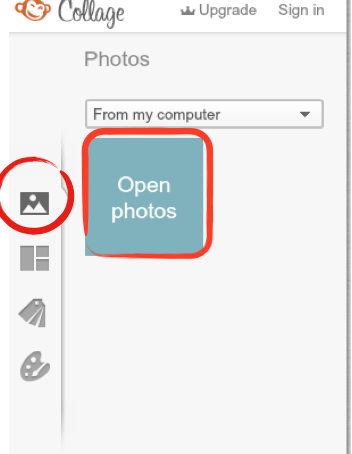 To begin placing pictures, all you have to do is click and drag them onto your desktop, and then click “Open Photos” from the “Photos” button on the left. Choose your picture, and then drag it onto the collage. Repeat these steps of dragging to desktop, opening it in picmonkey, and then dragging it onto the collage, until you’ve filled it! You can also make some pictures bigger/smaller like in the original image I showed above. You can do this by clicking the pace around the image, and dragging it the way you’d like it. 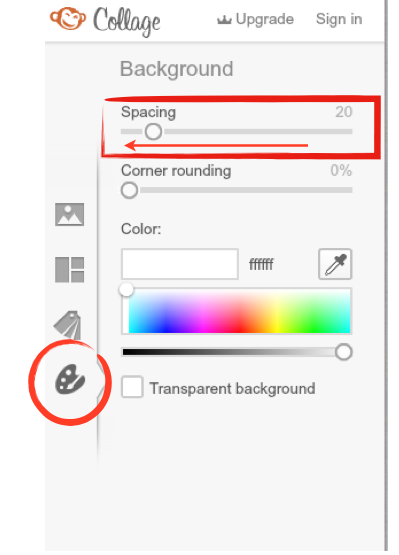 If you’d like there to be no spaces around the pictures (no borders), you can click on the “Spacing” slider which is found in the “Background” menu on the left, and drag it all the way to 0. You can of course play around with it any way you want…but I have one more important step before you save it & make it your desktop pic! 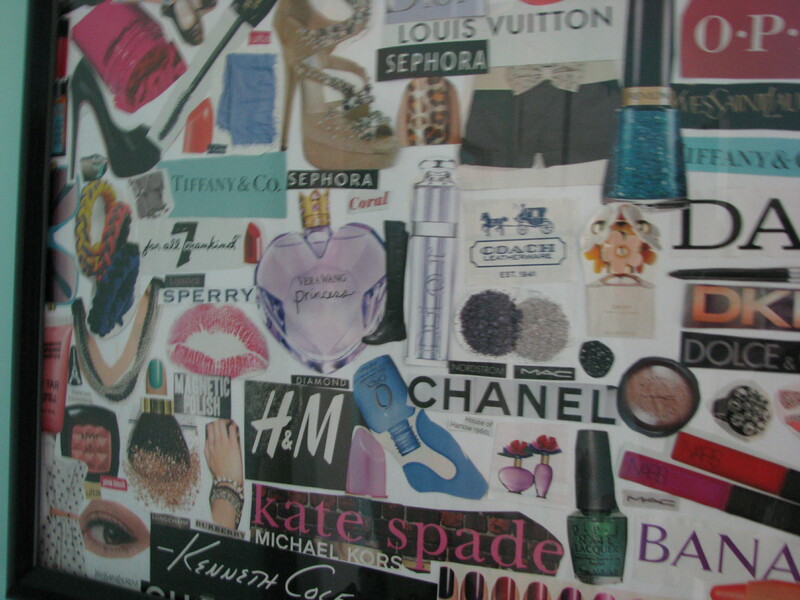 You must change the dimensions of the collage, so that it doesn’t turn out blurry. 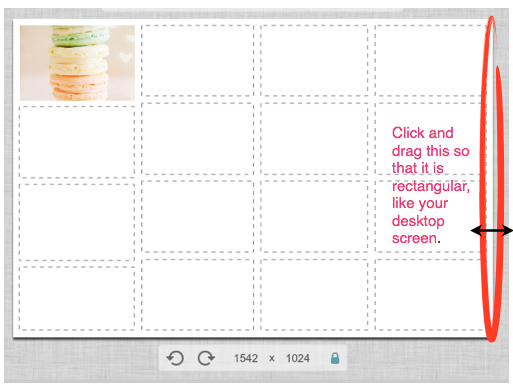 I just clicked and dragged the sides to make it rectangular, similar to the dimensions of my desktop screen. 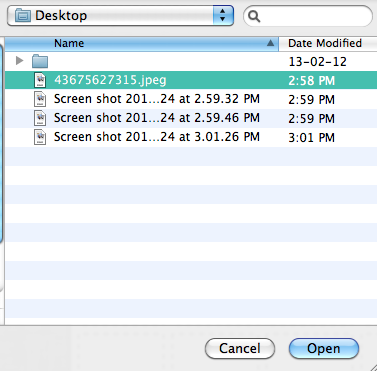 Now, click “Save” at the top, and then find it in your files, and right click on it, to find “Set Desktop Picture”. Depending on what computer you have, you may need to go into your setting to do this. I just grabbed a whole bunch of images I liked from my tumblr. It took some playing around with to get them the exact way I wanted. I considered if the picture had lots in it, which colours it was, and how similar it was to other images around it. For example, I didn’t want to have all pink pictures in one area, and not anywhere else. Just fiddling…. But, they are so cool looking! You can do it with absolutely any images you’d like, including ones of your own. I’ve got my fav youtuber (Zoella), T. Swift, and Gossip Girl’s S & B. I also have my painting inspo, and a few things I’m currently drooling over. The possibilites are endless, and they turn out great….oh, and it’s free! Image of computer inspo found here. All other images are screenshots of picmonkey.com, or my own desktop image. Hello! So sorry I haven’t been posting for a week! Oopsie! January has being pretty nuts for me…and it’s going to continue to be like that all the way through. I have EXAMS. Yep. Just to get an idea, yesterday I had a science test, today I had a science test, tomorrow I have a french exam, monday I have a french exam, monday I have a geography quiz, sometime in here I am going to have another french quiz, a french exam on friday, a geography exam the next friday after that, and then my other two exams on that next monday and tuesday. GOODNESS. So I’ve gotta get studying! The exam that I have on Monday, it’s a 3 minute long presentation in french that I’ve been memorizing, so I have been a little stressed with that. Oh, and then I start a new semester on Feb. 5th, which is my easy semester with English, Business, Math, and Family Studies. Thank goodness I got science and french over with. Haha, so I apologize if I won’t be posting very frequently throughout the month…I’m not dead! I’m just…consumed with craziness. My collage! 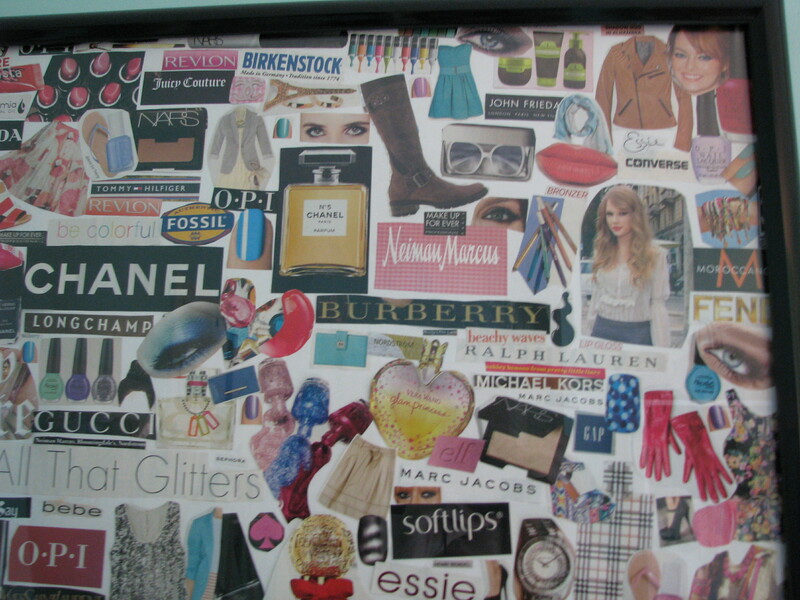 I have a collage that I made about a year ago in my room, and I am doing a full post on it! I’m going to share my tips, and ideas, and a few close-up pictures of mine. To be honest I don’t even know where I got the idea from to make one of these, it was so long ago! And I wanted to say that I have also started making one with birds from Birds And Blooms magazines for a birthday present for my Aunt and Uncle…so they don’t have to be just beauty…you can use whatever clippings you’d like! Here are a few things I’ve learned that I want to share! These are just what I did with mine, but obviously you can customize your’s however you desire. Make clean cuts! 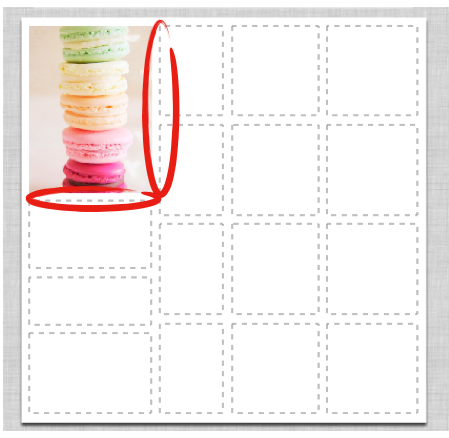 Go around the image neatly and evenly to make it look nice and neat. Don’t worry about overlapping, but don’t do it too much. 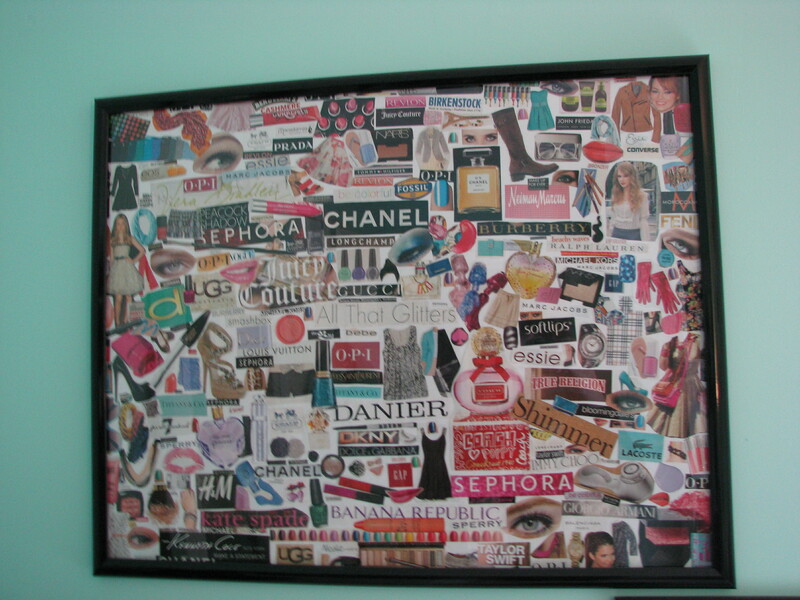 When you get almost done, you sometimes will have some little spots to fill up, but pick and choose the right sizes of pictures so that they try to fit well in the blank space. Try to fill up as much area as you can, but once again, don’t overlap too much. Remember that you can change up the angles of things for a cool look. All sizes welcome! I think a collage looks better with lots of sizes of images cut out. Even out the colours. I liked to make it sort of all even, and not too dark in one place, or too pink in another. Keep in mind that when you are done your eye might go to one single thing, and you want to be sure that you really like that thing. Don’t make the focal point something that you don’t love. Even out the sizes too! Make sure there aren’t huge things in one spot, and little things in the other. Keep in mind that if you are framing it, the frame will cover up the edges a little. Do you want writing or no writing? I liked an even mix of both. Keep a large garbage bin right beside you so that you can just lean over it while you are cutting the images for an easy clean up! If you are looking for really little things to fill up some space, you can use words you like. For example ‘blush’, or ‘Nordstrom’ to fill out the little spots. Make sure that you love every single thing you cut out. That is what made mine so special to me. I really went through tons of magazines, and picked out things that I really liked or that sort of had a story to them. 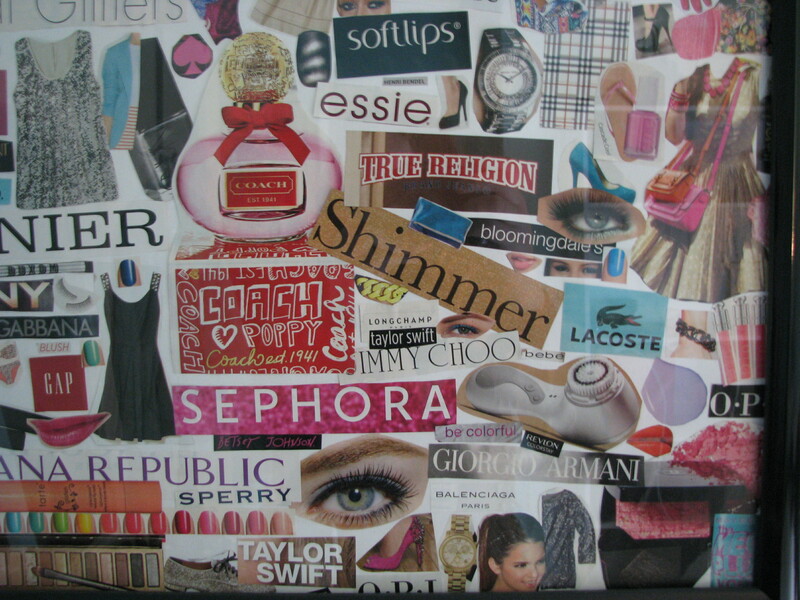 I really can’t say that I dislike ANYTHING on my collage. This is what made it the most time consuming for me. 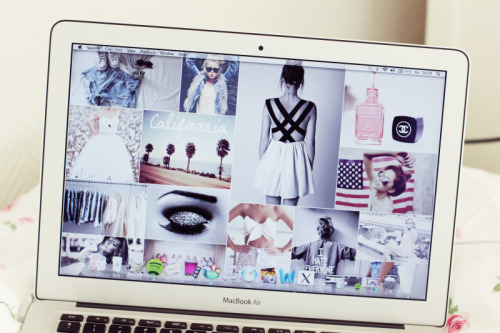 I always found things that I loved, but there would be like article writing over them and I didn’t use them…haha. By the way, I did this collage in sort of two periods. I worked on it for a few months, and then took a long break, and then got into it again. 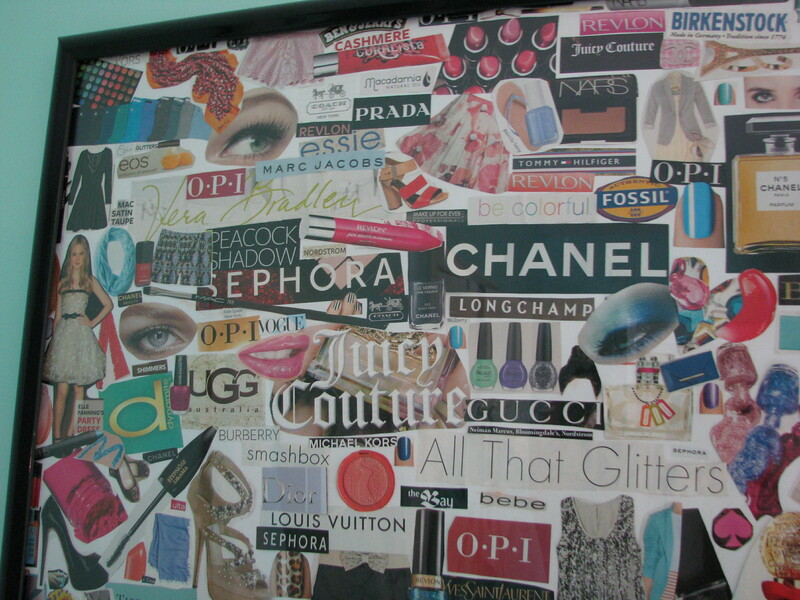 I just used old magazines from around my house and a bristol board. Anyways, enough with this, here it is! I have seriously gotten so many compliments on this thing! I just can never stop looking at it whenever I’m getting ready in the morning. Thanks for reading! Talk to you soon, and please let me know if you make one or have one! Bye! Hello hello! I’m so excited to share my favourites with you guys this month! YAY! So, I’m going to start out with my three song favourites! Of course, it will never be a favourites post without some Taylor Swift. This month I have been loving We Are Never Ever Getting Back Together, and Last Kiss by her. And, I’ve also been liking Ed Sheeran’s ‘The A Team’ covered by Boyce Avenue. I will get asked “why do you have the cover instead to the original?” and it’s because I will sometimes like the cover better! I absolutely adore Boyce Avenue, I just feel like there songs are NOT hit or miss, they are all amazing. My two food favourites of the month are double chocolate muffins by Quaker, and peaches! For some reason I just love peaches! I’m sad that they are going out of season though! I have no makeup or nail polish favourites for the month because I haven’t been painting my nails much at all, or doing my makeup, because I am a lazy bum and I don’t leave the house! I really hate saying that, but I’ve been having some arthritis fatigue issues lately, and it just makes me want to stay in bed all day. It’s hard trying to exercise or get out of the house when you don’t feel good constantly. My favourite TV shows of basically all summer are Pretty Little Liars (of course) and Big Brother! I’m so sad Britney went home!! I was a Quack Pack lover all the way! Now I think I’m rooting for Ian! Another favourite of the month is my new room! After we got back from the cottage mid-august, I’ve been re-decorating my room, and it’s almost all coming together! You guys have seen my room before I re-did it, but I am still going to be doing a room tour! Oh, and another favourite is Lindsey, or beautybaby44! I’ve been watching her a lot this month, especially her hauls, and she’s awesome! So that’s it for my monthly favourites! Thanks for reading! Hopefully the next time I do my favourites of the month, I will have survived my first month of high school! I’m pretty terrified! Anyways, talk to you soon! Goodnight! PS, You guys want TGIF and Motivational Monday back right? I put it on a break for summer, but you guys liked it right! I have to come up with something for TGIF because it was just kind of random posts last time I did them…tell me what you think! Liv’s Life: Back To School 2012 TAG! Hello, hello everyone! It’s that time of the year again…back to school! I thought I would do the back to school tag because I love tags and somehow haven’t managed to do this one yet, so here we go! If you would like to do this, leave it in a comment below or do it on your blog and link it to me! I’d love to check it out! 1. What grade are you going into? Nine! Yes, I am going to be a freshman in high school…yahoo! Haha it’ll be interesting. 2. What are you excited and nervous for this year? Everything! I’m a little nervous because I had some issues with friends (not fighting, just kind of drifting apart) last year and I feel very alone currently, but I am also excited to enter big girl town and actually be taken seriously in the world. Probably my number one most exciting thing is fall fashion and nail polish which is ridiculous. I ADORE fall, so I’m really exciteddddd! 4. What grade were you in when you first started wearing makeup to school? Seven. 5. Where or from whom do you like getting inspiration for back to school trends & styles? YouTube! I have been watching lots of macbarbie07 and beautybaby44 recently. 6. What are your favourite trends for back to school/ fall this year? I really like just the classic fall trends like wearing a think sweater with a scarf, skinny jeans, and riding boots (ahhh it makes me so happy thinking about it…I’m such a nerd haha). Yeah I really like scarves if you guys can’t tell. I also really like the polka dot trend for fall right now, and I also love wearing plaid shirts. 7. Where do you like to go shopping for your school supplies? Staples usually. Sometimes if I’m at Zellers or Walmart I will pick something up if I forgot, but it’s usually Staples. 8. What are your favourite stores to back to school shopping? I’m assuming this means clothes…Well I don’t really have a ton of money to be buying clothes, but I really like my typical favourite stores like Garage and H&M and stuff. 9. Will you be carrying a purse or backpack to school this year? And which do you prefer? Well this is my first year of being able to carry a bag from class to class if you were wondering…I will be carrying a Longchamp tote I think. I prefer totes. 10. What are three non beauty essentials that you have to carry in your back to school purse? Well like I said, this is my first year of being able to carry around a bag class to class, so I have never had a back to school purse…but I am just going to throw three things out there! Probably my phone, headphones, and gum? 11. What are three beauty essentials that you have to carry in your back to school purse? I am not the type of person to bring makeup with me places after I already put it on in the morning, unless it is a special event I am going to. So I don’t really know…I know like a hair brush and hair tie! 12. What are your go to hair products this year and what is your favourite hair style for back to school? For fall I really like straight, sleek hair, and sometimes in a high pony. I always like curled hair too, but for some reason I think that straight hair looks really good! 14. What are your favourite clothes and accessories for back to school? Scarves! Big sweaters, riding boots, skinnies, plaid shirts, stuff like that. I will be doing lots of OOTDs once I start actually wearing nicer clothes haha. That’s it! I tag all of you! Talk to you soon! Thanks for reading! Hello hello! Happy PLL day!! I have another three of my favourite websites to show you! All three are beauty & fashion related, and I have been following for a long time. Talk to you guys tomorrow for SOFC! PLL tonight!! And here’s a link to my previous SOFC posts! Some Sparkle: Summer Besties (with a little twist!!) TAG!! What is your favourite…for summer!? Nail Polish? Probably Butter LONDON Slapper! Eye Product? Stila eyeshadow in Kitten, Stil Smudgeproof liner in lionfish! Accessory? Stacking bracelets! I love accessories right now! Clothing? My romper I showed in my Europe haul! Anything bright too! Shoes? idk..I am getting a pair of gladiators, so probably those! Drink? Water and orange juice. OK, that’s it! I will have one more post up right now. Talk to you soon! Let me know what your favourite products are below! Thanks! Wanna know where else to find me!? 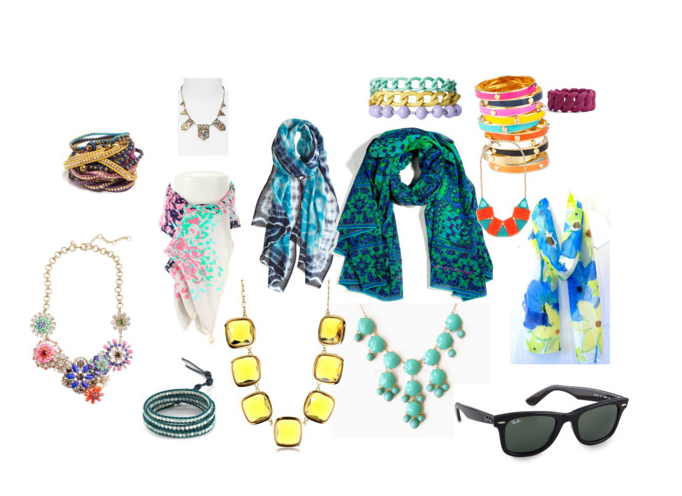 My newest Some Sparkle: My Current Wishlist-May 2012!